Michael Tree died last night at his home in New York at the age of 84. 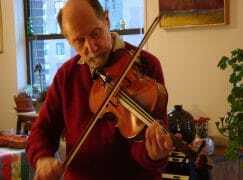 Son of the noted violin pedagogue Samuel Applebaum, Michael studied Efrem Zimbalist and appeared as soloist with many orchestras and on numerous recordings. He was co-founder of the Guarneri Quartet, with Arnold Steinhart, John Dally and David Soyer. They played together for 45 years and were America’s most recorded and widely toured string quartet. Michael was mentor to dozens, perhaps hundreds, of viola players. Incredible musician & player. Wonderful human being, beloved teacher, & just all-around “mensch”. Condolences to his family. A wonderful person.Great musician,family man and a great friend. We all shall miss him a lot. It was a shock to hear of Michael’s death. He was a friend of ours and came on tour with my husband’s orchestra to play a wonderful Harold in Italy. A wonderful musician and man. My condolences to his wife and children. Condolences to Michael’s family and friends. Such a wonderful musician and human being. He was also the viola of the extremely popular Guarneri String Quartet, a group many of us remember with great fondness. No mention of the Garneri Quartet?? I’m sad to hear the news. I never met him, but having read Steinhardt’s “Indivisible by Four” about the Guarneri Quartet, I felt like I knew him a little. Condolences to his family and friends. There is a late legacy of Michael Tree’s playing in the Dover Quartet’s album called “Tribute.” He joined the quartet for Mozart’s string quintet (with two violas) in C minor, K. 406. It was recorded in December 2015 at Curtis, where the Dover Quartet originated. The very name of the album is a reference back to the Guarneri Quartet, who were mentors in various ways to the Dover Quartet, including Michael Tree as teacher of the Dover’s violist, Milena Pajaro-van de Stadt. It’s a remarkable musical document in this way, with the inspiration and effort that went into bringing Michael Tree directly into the performance of this leading quartet of a much later generation. Condolences to all who knew and were highly influenced by this notable musician. I remember Michael playing a Mozart violin concerto in Central Park at the Naumberg Bandshell when he first graduated Curtis a few years before the Guarneri’s founding @ Marlboro. Who knew that he’d become the violist of the outstanding string quartet of its generation! Holding season tix to the Guarneri’s Met Museum series for many years, we were saddened when they stopped playing in ’09. Michael was always fun to watch as well as listen to. When Mickey became “Michael Tree,” now played the viola and formed the Guarneri with his friends and colleagues, we gave Bourbon to him. He renamed the puppy “Homer,” and as the Guarneri became famous, there were a number of occasions when they were photographed in magazines and newspapers, and more than once Michael was seen to be holding Homer. The dog became famous along with Michael. I gave the violin up for the discus when I was on the track team at Millburn High School. Looking back, I never became accomplished at either. But happily, a life-long friendship with Michael and Jani and their family emerged and continued for all the years thereafter. My deep condolences to Jani and the family. I will always miss my good friend Michael. There is a great recording of the Brahms Horn Trio with Michael Tree (violin), Myron Bloom (horn), and Rudolf Serkin (piano). Definitive. The first time that I met Michael Tree in person, after a Guarneri performance at South Mountain, I felt as if I had known him forever: at the beginning of each semester at Weequahic High School, a teacher named Simon Chasen would ask my classmate Sherrie Amada « how’s your cousin Michael? Is he still playing? ». To his family, I send my deepest sympathy.